Uglyworld #267 - Ready For A Snowball Fight, originally uploaded by www.bazpics.com. Today I was out in the garden trying to clear a path through the fresh layer of snow between the door and the street where my car was lying, and after I had cleared about half of it some of the little guys came outside to play in the snow. I checked on them a few times, which Babo seemed to be a little bit annoyed about as he told me, "We can look after ourselves, we're not 2 year olds". I reminded him that Cinko was actually not even 2 years old yet which he conceded and promised to look after him. As I walked back towards the driveway I was suddenly hit with snowball after snowball and I began to wonder where the hell they were all coming from, when I turned round all I could see was a flurry of snowballs coming from the direction of Babo with Wage, Cinko, Wedgehead and Ox rolling around in the snow in laughter beside him. 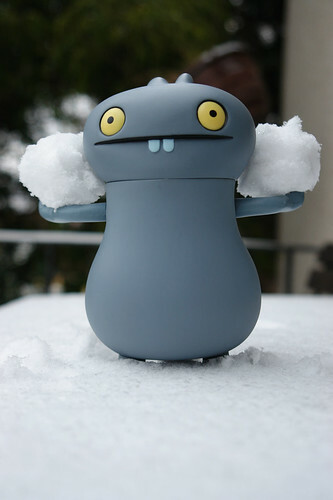 It turns out that the other 4 Uglies had made a huge stockpile of snowballs which Babo was able to scoop up quickly one after another and throw by making his arms spin round like "windmills" as he so elequently put it. I asked him to pose for a picture which he kindly did (before pelting me with another 30-odd snowballs as I walked away - to the laughter of the others once again).